I paid for 200K, he was lagging (Only once we started playing poker mind you) and I only received 80K in poker before he disconnected off Y!PP and Skype. I don't think he'd scam for $7, but who knows. 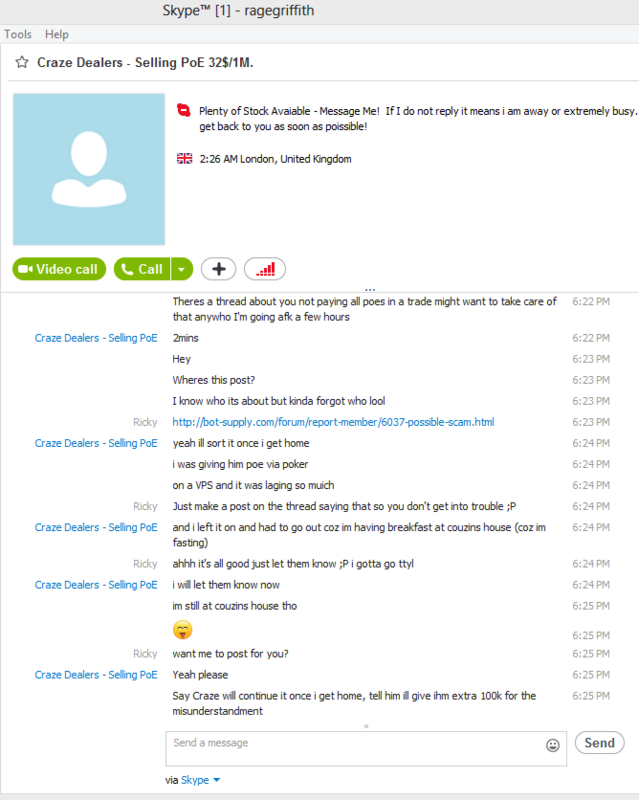 Probably just internet issues, but the really sketchy thing is that he said he was lagging due to his runescape bots. If that were the reason, he wouldn't have d/c'd completely. Have all chatlogs and skype logs ready for any staff that wants to take action. I apologize hugely for this mess i have left you - I thought that you would the VPS would stay logged on and keep letting you get the PoE but i was wrong. I turn't my PC off and it seemed that you did not recieve my message. I am currently at my Couzins house however as soon as i get home if you are online i will continue to give you the 110K i owe you. On top of that i will give you an extra 100,000 COINS! Hey Craze, thanks for doing your best to contact me, everyone makes mistakes. I just got the 120K he owed me, and he'll give me the extra 100K tomorrow. Big shout out to Rozay and Rage too for helping. Money and Craze like this.